It is always advisable to book details of your Wedding as early as possible to avoid disappointment. 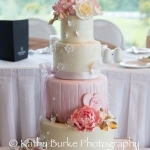 Gemma & Kevins Wedding cake was booked early 2013, with Gemma knowing from the outset what she wanted their Wedding cake to look like and to my delight tall and elegant was key. 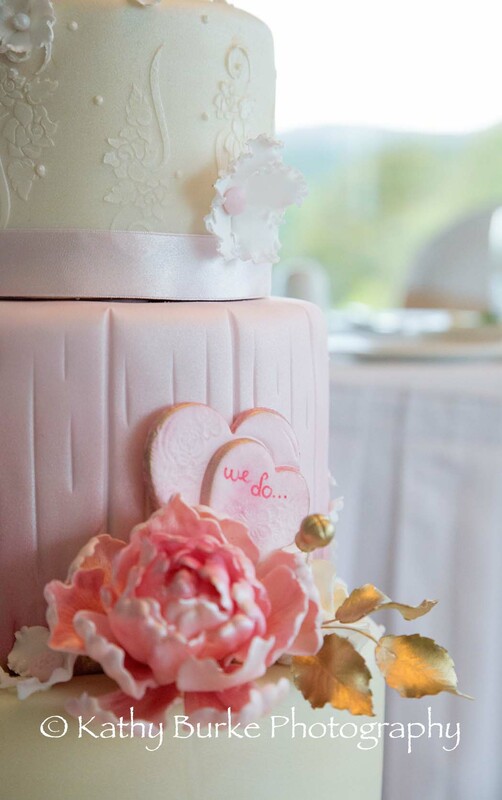 With their ideas clearly focused on a particular style of cake next the flavours required were decided on. 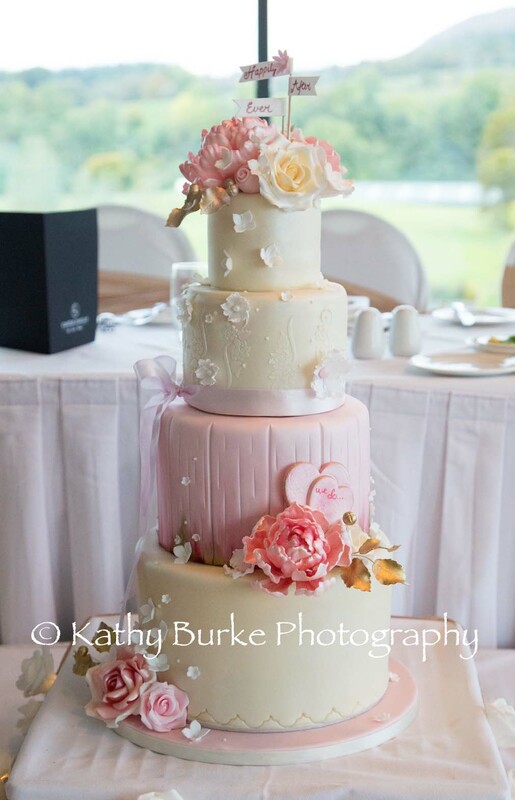 Red Velvet was a definite favourite of this couple, so much so they would’ve had all 4 deep tiers in that flavour. However, in the months before their big day I introduced them to one of my favourite cake flavours White Chocolate & Raspberry. A final decision was made to have half Red Velvet and half White Chocolate & Raspberry a lovely happy medium. 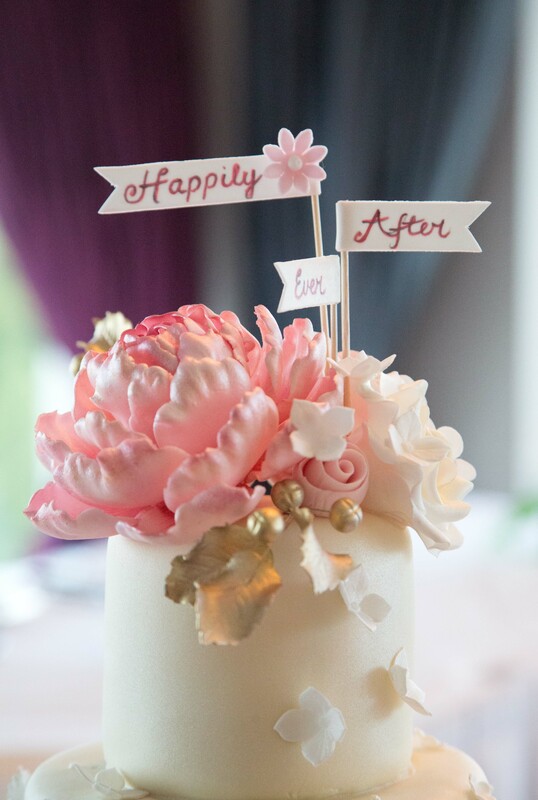 As the overall style of the cake was tall & elegant, the decoration chosen was feature large sugar peonies and roses with Gemma & Kevin happy for any additions to be made, all of which were made in the couple of weeks before their big day due to the time required to complete. 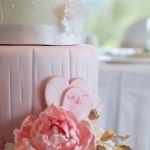 A lovely colour palette of ivory/champagne and pale pink was chosen. It’s amazing time just flies, over 2yrs since their Wedding Cake was booked and the week of Gemmas & Kevins Wedding day is here. With no time to waste baking the many layers of Red Velvet & White Chocolate & Raspberry started early in the week. The many layers were then levelled, filled & covered with Chocolate ganache in preparation for a layer of fondant icing. A visit from Gemma & Kevin at this un-iced stage to see how their cake was going to turn out was lovely as not all couples get the time to preview their cake. 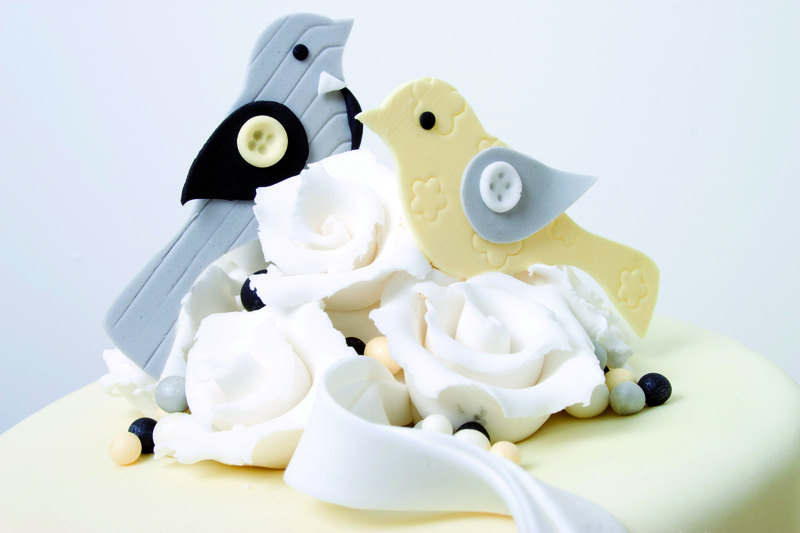 (Always an anxious stage as you never know how a couple are going to react when they see their cake un-iced, whether they can envisage the final look or not). 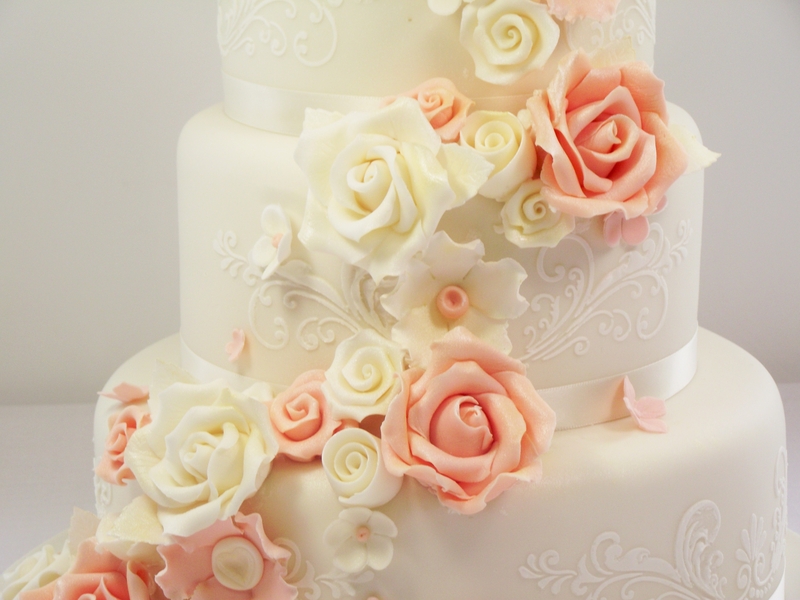 In completion all tiers were iced, had lustre dust added and all floral decorations were carefully added. 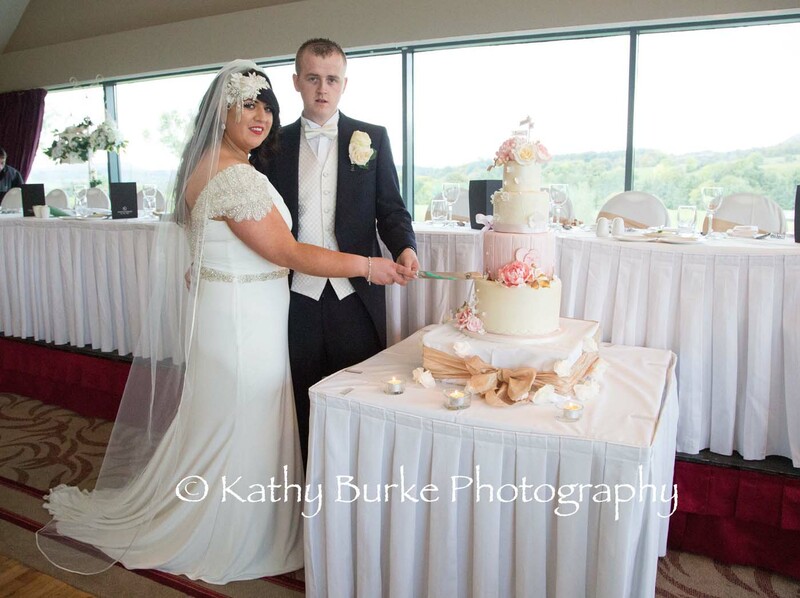 We delivered their Wedding Cake to Castle Dargan Hotel early afternoon to a beautiful function room decorated by The Enchanted Wedding Company. 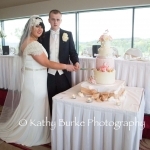 The couples photographer on the day was Kathy Burke Photography, who produced these lovely photographs for us.